How are you babies? Did you have a good flight just now? I hope you both are settling down well at Makyeng's. 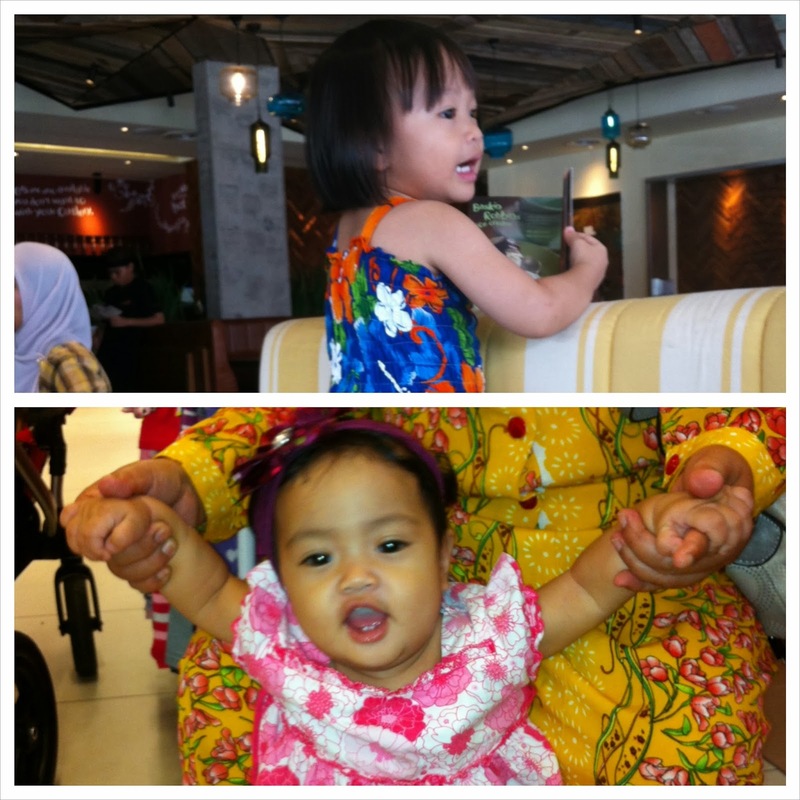 Khadeeja, mak pray tonight you will sleep soundly and sweetly - even when it's your first night away from me. Just now on our way back from the airport, mak cried buckets of tears thinking of both of you. The memory of Khayla crying and stretching your hands towards us as your Ngah carries you to the departure hall keeps re-playing in my head like a broken record. It just breaks my heart that we have no choice but to do this - to send you both away so that we could concentrate on our studies. Are you feeling sleepy already? Have you had your dinner? Mak is wondering what are you both doing now. We had so much fun last night, playing rough-a-tumble. When I caught you girls by your ankles and turned you in somersault, you both giggled so hard. Khayla, remember you kept asking me, 'Some more angkat, mak! Angkat Khayla!' And after your turn, you remembered to take turns with Khadeeja and asked me to lift your baby sister. So much fun (even though it's tiring for me!) wasn't it? Hush adik, go to sleep. Makyeng is tired after a long journey today. Thank God for technology nowadays, I could make video calls and watch you girls from afar. Khayla, have you stopped jumping on the bed? It's time to sleep ok. Khadeeja, no crying. Else mak will start to cry too. How I wish I could have your fingers wrapped around mine right now, darling. Khayla & Khadeeja. So many nights we fall asleep together, both of you lie with heads nestled in the crooks of my arms, Khadeeja reaching out to my lips as you breastfeed, and Khayla running your hand up and down my arm. Oh my babies, my heart is aching for you now! In the car when we were going to the airport, I cuddled you and let you breastfeed. You stared at me throughout half of the journey, as if you could sense our separation. Such a wise child you are, wise beyond your 9 months of age. I told you to be a good girl, to listen to makyeng and not to bite your sister. Before you left, I hugged you tight and desperately inhaled your scent. Locking all essence of you in my memory. Your thick lock of hair smelled of sweat from your strenuous efforts of taking baby steps at the airport. Your chubby cheeks smelled of your saliva, they say it's the smell of baby's breath and it is the sweetest smell in the world. When I buried my face in your neck, you squirmed but you let me do that. Baby, only Allah knows how sad I am for I would be missing this time of your life. I would probably miss your first proper walk (although you did attempt and manage to walk 3-4 steps on your own towards me the night before). You are only 10 months old once! I miss our conversations already. I recall a few nights ago I was doing my assignment when you wandered in to check on me, 'Mak what are you doing?' I replied, 'I'm studying, sayang.' You nodded in understanding and commented, 'Study? I see...' And I wanted to grab you and plant kisses on my cheeky little tot! Sometimes I forgot that you are only 2 and a half, because you sound so grown-up now. But when you climb into bed next to me and throw your arms around me, it never fails to make me realize that you are still so small, still my little baby of 31 months old! I'm going to stop writing now, my angels. If I continued on, I might get teary-eyed again and cried myself to sleep. I want to go to sleep dreaming of your sweet smiles and baby laughter. Sleep tight darlings. Say nighty-night and kiss me. Dream a little dream of me. Sob sob sob..aku yang sedih. Macam aku lak jadi hang. Aku tak sekuat hang la..kalau aku la, mak aku dekat lagi..hujung minggu boleh tengok anak2 tapi hang..huhuhu..habis exam ke baru hang balik ambik diorang?